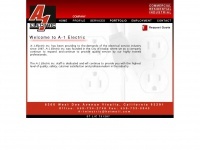 A profile of A-1electric.net was found on the social network LinkedIn. The web server with the IP-address 50.28.102.108 used by A-1electric.net is owned by SourceDNS and is located in Phoenix, USA. This web server runs a few other websites, mostly in the english language. The websites were created using the programming language PHP and they are hosted on a Apache server, which runs on the operating system Unix/Linux (Unix). The content management system WordPress is used. The HTML pages were created with the latest standard HTML 5. Due to the robot information on the webpage, the following actions by webcrawlers are not allowed: indexing the website and following the links. All other actions by webcrawlers are allowed.